TO THE LAISSEZ-FAIRE BIAFRANS....HOW MUCH IS YOUR FUTURE WORTH? Things are very hard, no doubt about that, but the only reason why some people shouldn't take certain steps to betray certain principles is the ability of one to understand the future or how one values the same future. Like Essau of the Bible, many youths sell off their future for pittance. The social media has given vent for so many angry and hungry voices in our society, while the genuine angry voices continue to blast the unfair system and condemn the irresponsibility of the so called leaders we have at present. The hungry ones search for loaves to fill their stomach. Unfortunately, they are not given enough and will never be given enough. Many of our youths have turned deaf ears since the agitation for Biafra restoration began, maybe because of some poisonous gift they receive from their masters, while others do so because they feel okay and comfortable. But what this youths fail to understand is that if this continues, despite their sycophancy, all of us will be denied of our communal rights and will be made strangers in our own land. It is therefore the right time for all the Biafran youths to think about the future of our children and grand children unborn. In this noble quest for the restoration of Biafra, there is no middle group and we do not celebrate mediocrity. We either have it all, or we have nothing to call ours, considering that the Hausa-Fulani have already laid claim to our God-given resources, the crude oil. Are the future of our children and grand children unborn not more important that the cheap pittance you collect? It is time to think like human beings created by God and say no to any style of slavery, subjugation, marginalisation and lies. We must strip off that laissez faire attitude, because Nnamdi Kanu leadership has given everybody equal opportunity to get involved in the restoration process. Our future and our long run happiness is more important than any brief or short treasures you might enjoy today. Remember you cannot eat your cake and still expect to have it. Biafra is all we know & hope for... is either we get Biafra or we die trying. Say no to anything other than Biafra not even the so called restructuring of the contraption called Nigeria for it is too late for that because GEJ said something like that in the past but it was refuted. We the youths of his present generation in Biafra land are resolute and determined to restore our beloved nation Biafra we ain't going nowhere until we get Biafra. They will kill us but one is sure, the more they kill us the more they see us coming out in mass for we are even more than the Japanese soldiers. What runs inside of our Brains & minds in fact our entire body system is Biafra nothing else. 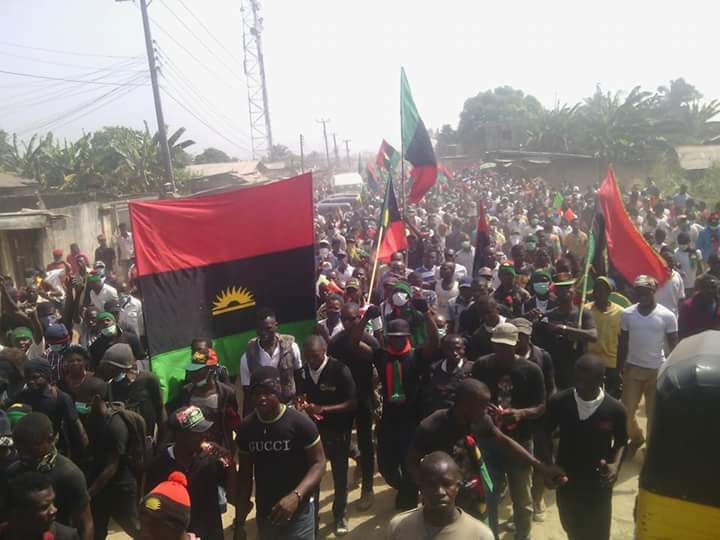 The zoo has expired and there's nothing to hope for in the contraption anymore, the latest now is Biafra all the way up. The Tiananmen Square revolution was organized by students. The German Wall fell because of students from both former West and East Germany working together. The Arab Spring was led by students. The Black Lives matter and other civil disobedience in the U.S. are led by students. It's only in Africa - especially Nigeria that university students are so afraid or too comfortable with mediocrity lifestyle to stand-up and speak-out. Biafra students must rise-up and demand for equality with their counterparts in the north and SW or be freed from this evil and satanic contraption called Nigeria that has denied them their dreams and destinies. Time to be free is now.